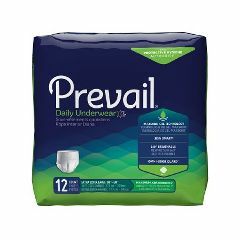 Prevail Protective Underwear Super Absorbency - Super Absorbency Ideal for men and women who want the look and feel of underwear. The soft, stretchable, cloth like back sheet provides an incredibly secure and comfortable fit. Ventilated panels allows air to freely migrate to the wearer, improving skin health and comfort by reducing heat build up. Advanced core design and fast absorbing Blue Stay-Dry Strip significantly improves skin dryness and reduces the potential for leakage, providing improved odor control, healthier skin and additional wearer comfort. For Moderate to Heavy use. Latex free. Purchase them for my 90 yr old mother, works better than the one's she used to get from Medicaid. Do you have large size as one more inch is needed?